While most of the poker world that was watching WSOP Europe action on Saturday was focused on the €111,111 One Drop High Roller or Day 1A of the Main Event, the €1,111 Little One for One Drop was playing down to a winner. 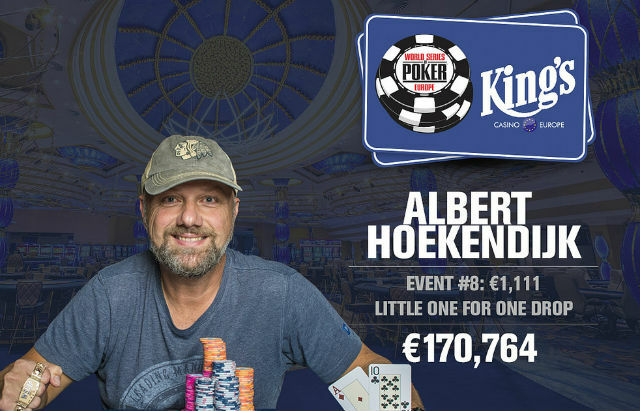 Dutchman Albert Hoekendijk ended up being the last player standing, topping an 868-player field to win his first career bracelet and the first for the Netherlands since 2012 when Vincent van der Fluit won a $1,500 PLO event. When the final table began, Przemyslaw Klejnowski had the shortest stack but just 23 hands in, he found a hand to go with that eventually offered him the chance to triple his stack. Klejnowski moved all in for 390,000 from UTG, Oleh Haisiuk and Hoekendijk called from the small blind. After the flop, Hoekendijk bet 230,000 and Haisiuk called. The turn was the and both players checked. They also checked after the river allowing Klejnowski to table , but Haisiuk showed for top pair while Haisiuk showed for a missed straight draw. Klejnowski was out in ninth place. Eight hands later, Artan Dedusha shoved for 625,000 from the hijack before Johannes Toebbe moved all in over the top for 1,575,000. The rest of the players folded and Dedusha showed which put him behind Toebbe’s . Dedusha could only watch in disappointment though as the board ran out to send him to the rail in eighth place. Dedusha hadn’t even finished leaving the table before another player joined him. On the very next hand Abdelhakim Zoufri raised to 110,000 from UTG. Serghei Lisiy moved all in from the small blind and Zoufri called all in. Lisiy was ahead with to Zoufri’s . The flop kept Lisiy in control and when the turn and river failed to give Zoufri an eight or a paired board for a chop, he was finished in seventh. The quick pace of eliminations continued and six hands later Jonas Lauck became the next victim. Thomas Hofmann button-raised to 140,000 and Lauck moved all in for 950,000 from the big blind. Hofmann called and showed while Lauck was racing with . The flop didn’t seem to offer much to Lauck, but the turn gave him a gutshot straight draw. The river was a brick though and Hofmann’s pair of twos was good enough to take the pot and eliminate Lauck. It took over an hour before the next player was eliminated. Haisiuk raised all in for 465,000 from the button and Toebbe called from the big blind. Haisiuk showed and Toebbe tabled . The gave Haisiuk extra outs to a wheel, but Toebbe made a set thanks to the turn. The river was no help for Haisiuk and he was eliminated. Four-handed play lasted just 45 minutes. Zoufri moved all in from the button for 1,400,000 and Hofmann called from the big blind with . Zoufri needed help after turning over . He got just the opposite on the flop and even more bad news after the turn gave Hofmann a full house. The river was the to make Zoufri’s bust official. Zoufri’s bustout allowed a short-stacked Toebbe to ladder up one spot in the payouts but not any further. Three hands later Hoekendijk raised to 300,000 from the button and Toebbe put his last 1,300,000 at risk and Hoekendijk called. Toebbe was ahead with to Hoekendijk’s but the flop flipped the script. The turn was the and the river sealed Toebbe’s third place finish. When heads-up play began, Hofmann had 55% of the chips in play, but over the next three hours, Hoekendijk and Hofmann traded the lead back and forth before Hoekendijk took control for the final time. Down more than 6-1 in chips, Hofmann moved all in for 2,600,000 and Hoekendijk called. Hofmann showed and was drawing live after Hoekendijk showed . The flop gave Hofmann little hope and the turn removed all of it. The meaningless river was the and Hoekendijk eliminated Hofmann to claim his first career bracelet and €170,764.